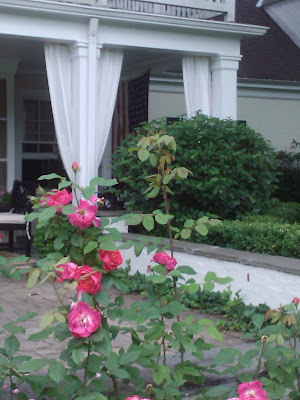 The Polohouse: Favorite on the First: SHARE YOUR GARDEN! Favorite on the First: SHARE YOUR GARDEN! on the first of June! here in the Chicago area. and many things have yet to bloom. Knock-out roses along the sitting wall. Maiden pink dianthus sits along a small stone wall near the grilling area. There is a new solar fountain/birdbath on the patio this year. of that area in a week or so. So show us what you've got! will include the thumbnail photo! Hallie got a summer haircut. She looks like a lab now instead of a golden! Alison, everything looks lush and green in your garden and that pink geranium full of blooms is gorgeous. I love geraniums! They remind me of my childhood. 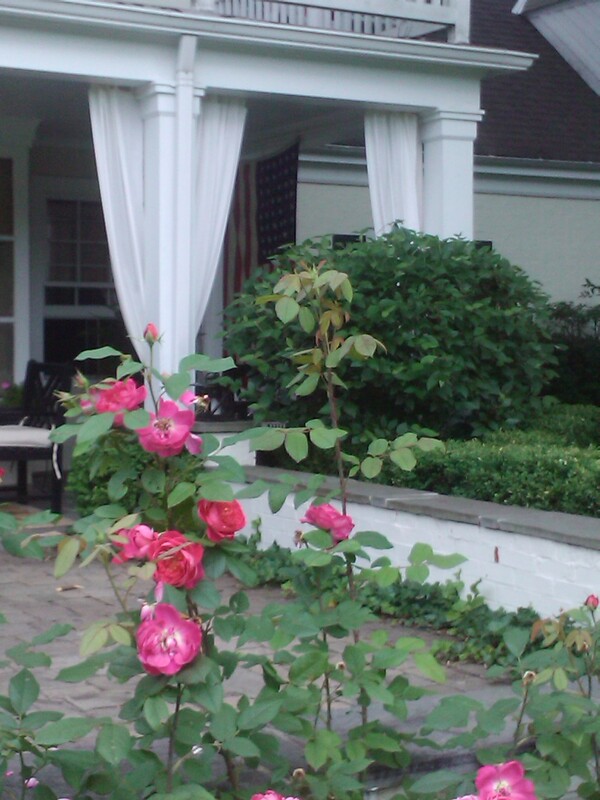 Knockout roses are abundant in our front garden that gets lots of sun. They seem to be nonstop bloomers here. We enjoy their beauty year round. Your new solar fountain will likely be the favorite bathing spot for the birds in your garden. How nice it will be to have this as a focal point. I'm sure you and your family will spend lots of leisure time out in this beautiful garden in the coming months. Your gardens look great Alison! We are just starting here so I am sharing a new project I just did for the garden! Hi Alison, everything looks so beautiful in your garden. Love your new birdbath/fountain. We have found the same thing here in UT. Things are blooming much earlier this year. Last weekend we received a lot of muuch needed rain. Thanks so much for this fun party. Happy Gardening! You know how much I just love your gardens...So beautiful and impeccably created...So many gorgeous flowers and vignettes to enjoy. I am in awe, as always! Having some technical difficulties with the thumbnails showing up. I think I just alleviated the issues but it could take a few moments for it to reset! Come back in a while and I am hoping you will see the photos for the party links! This blogging thing has its challenges! Alison, Your seating wall is just perfect with the boxwoods and ivy. Love the hot pink colors with all the evergreens and your black and white patio furniture. Solar bird bath?? OMG! I'm putting that on my shopping list. Thanks so much for hosting another great party. I'm popping over to Jennifer's, too. Your garden is just beautiful and I've enjoyed your lovely post. thank you for sharing and hosting The Garden Party. Alison, your pinks are looking lovely! I've linked up our veggie garden for today. I'll stip by later tonight to check out the other posts. Thank you for hosting this garden party! I just love your beautiful gardens. Thanks for hosting. What a lovely garden party. Thank you very much for hosting and for inviting me to join. So much inspiration here! Your gadens are superb. I adore your bird bath and black and white fabrics. Gorgeous! What lovely outdoor spaces you have! I'll bet that you spend as much time as possible outside in your pretty sitting areas. Thanks for hosting the party! Your gardens are just beautiful Alison! I got a head's up to come over and join you from Ricki @ Art At Home. Your home and property look quite stunning and handsomely groomed! Your Birdbath/fountain is great and I love the plants by the big trees. Michigan has had some of the same mixed up weather. 91 last Sunday and 61 today! You have a lovely garden and surrounding yard. So relaxing and pretty. I'm new to your party and blog. Thank you for hosting. Alison your grounds are absolutely beautiful!! Thanks for hosting and have a super weekend! Oh my goodness Alison it is all beaUtiful! I love your lanterns! Alison, Your yard is so lovely and manicured! It has so much character with you darling areas with architectural interest! I need a fountain! So so pretty. You choice of "lipstick" pink flowers pop against your home!!! Everything looks ready for summer! Thanks for hosting this fun "first"! Hi Alison, Your gardens are always beautiful I love the roses along your wall and all the lush green ivy, my favorite. I'm sorry I didn't get a new post up for you but we've had such dry weather I have nothing blooming so I'm sharing some beautiful gardens from my beach trip. Thanks so much for hosting, I always find wonderful inspiration at The Polohouse! What gorgeous gardens and landscaping you have, Alison! Are you pleased with your solar water feature? I've been thinking of getting one. But never used anything solar except for little lights. Alison, Your gardens are beautiful. I am intrigued by the solar fountain/birdbath. That is neat. Hallie looks great in the new "bob". We have been traveling for the past three weeks so my garden isn't presentable just now, so I will visit and enjoy the others. Oh, BTW, I did get by Antique Archealogy in Nashville. After I finish the suitcases of laundry I will post the pics. omg the garden looks stunning! and i love hallie's haircut! smiles to you, gorgeous lady. Ohhh! Hallie looks EXACTLY like a lab! She is darling and your gardens are so fabulous. This has been a most GORGEOUS spring up here in Minneapolis as well with all the RAIN we have been fortunate enough to get! Such fun looking at your gorgeous gardens, Alison. You have a beautiful home and your taste is exquisite! Your photos are gorgeous. The knock-out roses on your sitting wall are lovely. We have lots of knock-out roses, too. They're some of my favorites. Just linked up to your fun party. Thanks so much for hosting! Alison, happy to have found our lovely blog and beautiful landscape/gardens. I found you via Jennifer's garden party. Looking forward to catching up on your blog. Hallie looks too cute with her summer hairdo.....she does look like a lab! You are off to such a good start, thanks to all the wonderful weather you have been enjoying. Your roses are looking great! It my first time to join your Favorites on the First party. Thanks for hosting this fun party! What lovely pictures. I wish I could have joined in this Favorites on the First. Have been traveling and am finally catching up with blogs. When I get a little recovered from my trip, I'll have to come back and check out the links. Your home & gardens are as always....inviting & stunning! From the blossomed flowers to the solar fountain. Tres jolie! Love it all! Thanks! for sharing this inspiring post. Your peony question is the proverbial $64,000 question! Everything looks beautiful in YOUR yard & gardens, Alison. Thank you for sharing the blessing of the color, design and uniqueness with us. I love your landscaping, especially the rows of low plantings near the front porch. Some look almost chartreuse, and some look a little darker than those. What are they called? I have a place in my yard where I think they would look good. I have looked at your pictures so many times! They are beautiful. You left no link to respond back to you and there is not an email address with your blogger profile, so I will answer you question here! I only hope you will come back and find it. All the bright ground cover is pachysandra. If in the shade the leaves are much darker, but in the sun they stay lighter and brighter!